Every time you turn on the TV or radio there seems to be someone debating how to use the humble apostrophe correctly; or whether it should be allowed to languish and die. People either love it or hate it and I think this often depends on whether they understand the correct usage or not. Birmingham Council has been castigated for getting rid of apostrophes on all their signs. Druid’s Heath or Druids’ Heath? It depends on whether there’s a single lonely druid cavorting at the solstice or a group of them having a knees-up! But apparently Birmingham has got tired of staff time being wasted dealing with complaints from purists. Then there is the ‘grocer’s apostrophe’ where unnecessary apostrophes insinuate their way into simple plurals (apple’s and orange’s for sale!) At the other extreme, one of the biggest grocers – Tesco – has been know to sell ‘mens magazines’ and ‘girls toys’. And on the Internet the debate rages on. Search for the correct use of the apostrophe and there are over 83,000 results. So I’d better declare my position! I like everything to do with words and the English language. I’ve got a soft spot for the apostrophe and would hate to see it disappear. That’s why most of our courses include a short handbook on Punctuation and Spelling (written by yours truly). As a writer, editors and publishers expect you to get it right. If you don’t, you’ll undermine their confidence in other aspects of your work. There’s a good debate on the subject at the BBC website and if you want to check your own use of the apostrophe, visit our sister college’s site (STT) where there is an article in this month’s issue of Keynotes. Finally, if that convinces you that the ‘tadpole’ needs to survive you could always join the Apostrophe Protection Society! Comments Off on Save the Apostrophe! Earlier in the year the BBC ran a series of programmes in its ‘Poetry Season’. These covered an eclectic mix of poetry ranging from Sir Gawain and the Green Knight to the works of T.S. Eliot and other more contemporary bards. And you didn’t need to be a keen poetry fan to enjoy the programmes! I’d studied Sir Gawain years ago at university and the experience was pretty ‘underwhelming’. But Simon Armitage, the narrator, really brought life to a piece of work that had been written in middle- English in the 14th century. So much so that the following weekend found me walking the Roaches in Staffordshire to visit Ludd’s Church where the final confrontation between Sir Gawain and the Green Knight is reputed to have taken place. It was a terrific walk and the damp, church-like cave, hidden in green foliage and dripping with moss was no disappointment. We might moan about the BBC and what it does with our money, but at its best it’s hard to beat! And still on the subject of poetry, you hardly seem to be able to sit down to watch a drama without one of the characters muttering darkly “Do not go gently into that goodnight”, one of Dylan Thomas’s most famous poems. His daughter, Aeronwy, died recently and her autobiography about life with her father will be published later this month. An extract appeared in the Sunday Times a couple of weeks ago and whether you’re a Thomas fan, or not, the book looks like being an interesting and eyebrow- raising read. But would you expect anything less of a story about a poet who could drink with the best of them and his feisty wife who thought nothing of coming to blows with her husband over his infidelities. It’s certainly one I’ll be putting on my holiday reading list! Last time, I had my say about the need for writers to read. But we’re currently being told (by none other than Arnold Schwarzenegger) that real books will soon be obsolete. 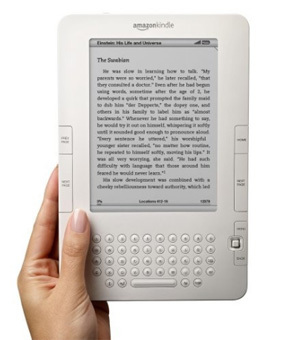 Instead we’ll all be using electronic book readers like the Kindle from Amazon. He’s advocating that all students in California should switch to e-book readers in a bid to cut spending on school text books. I think that he has a point and that as they become more sophisticated and less expensive more and more people will buy and use them. But I don’t think we’ve rung the death knell for paper books just yet. They still take some beating when it comes to reading in the bath! And just to prove the point, BookCrossing is going from strength to strength. If you haven’t heard the term before it’s the practice of leaving a book you’ve read for someone else to pick up by following your online directions. Currently, over 800,000 people in 130 countries are involved! Moving on, have you visited the BBC’s Writers Room yet? They say “We’re always on the lookout for fresh, new talented writers for a changing Britain”. There’s lots of useful information on the site (as you would expect) including current opportunities and where to send scripts. And any tips or advice you pick up on the site really is coming straight from the horse’s mouth. Let’s be honest, in the prestige stakes, there’s still little to beat working for the Beeb. I’m always amazed by the number of would-be writers who say that they never read other people’s work. Apparently, they don’t have time! I don’t believe you can be a writer if you don’t read…anything and everything, omnivorously. It doesn’t matter whether it’s pulp or classical literature; fiction or non-fiction; Internet or paper based. If you don’t read other people’s work you’re not giving yourself the tools you need to write. The best way of getting inspiration and improving your style is to see how various other people use words. You can then start playing with and manipulating your own writing and you’ll soon start to sense an improvement. OK, lecture over. It’s probably time to climb down off my hobby horse! But if you want to read what others have written – and have the opportunity to win yourself a prize at the same time, visit the Telegraph. They’re running a weekly travel writing competition for articles up to 500 words. The prize is £200 in foreign currency of your choice. But have a good look at previous winners before you submit. Finally, if you need help finding markets for your work, check out the new Freelance Market News website. The Editor, Angel Cox, has added some useful resources, including literary festivals, competitions and sites for writers. And a big plus is that as a subscriber you’re eligible for a free appraisal of your work – poetry or prose.